Our very Full House: Ethan's 5th birthday! Today, my littlest guy is five! We had a birthday party with family on Saturday to celebrate. Ethan absolutely loves Mario Kart, so that was the theme of the day! We were so fortunate to have both our close family and some far-away family come. just sits in silence, taking it all in! Olivia's sister Annelyse is exactly 9 months younger than Lola. who usually doesn't have to share her dollies with anyone! Lola decided to try on Annelyse's boots when she wasn't looking. She loved them! The cousins played Mario Kart for a while, while we waited for everyone to arrive. So cute with them all lined up on the couch! Ethan had such a hard time waiting to open presents! At one point in the day, when Aunt Aimee told him it was only a few more hours till he could open them, he was so upset that he told her he just thought we should cancel his birthday! But the time finally arrived. We decided to let him open Grandma Jane's present first, then eat, then open the rest. ....a new Imaginext Samurai castle! After dinner (pizza, requested by Ethan!) it was finally time to open the rest of E's presents. Soon there was paper flying everywhere. ....and she didn't disappoint this time! Love the look on his face! A giant, super soft Mario Kart blanket!! Ethan loved it and has slept with it every night since. Grandma 'Nette and Grandpa got Ethan his other favorite toys--trains. From Mommy and Daddy--the one Imaginext plane he doesn't have! Aunt Karen got all three of the boys a very cool new board game. The boys played it with me and Grandma 'Nette the very next day and it was really fun. ....complete with the Mario Kart game. He was pretty ecstatic over everything! All kids love to lick the icing off! They know where the good stuff is. ....is now this grown up boy! 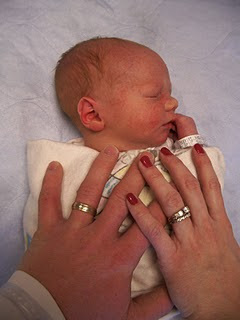 I love you Ethan Ryan--Happy 5th birthday! Love him. Looks like it was a great day! AAAH LOVED IT! Certain points I cringed, smiled, laughed and loved you. :) so many emotions all in one post. ;) So glad we didn't cancel the party after driving all that way. ;) love that boy. I don't comment often but had to this time. This boy is special in too many ways to describe and this space isn't large enough anyway. I will say: he has a gentle nature about him that you just don't see often. What I mean is he has a heart full of joy and a sweet shyness that you see in his smile that is stuck on his face :) He smiles all the time!!! Dev's children's Christmas blog backs up my words. I love how he is fearless with his older brothers and holds his own pretty darn well. He is 5 now and I remember like it was yesterday Dev walked in the front door with the 3rd youngest brother. I love you EE and am proud that you are the little boy you are!